A bowls club has existed in Exmouth since the 1890s and this club was part of the Exmouth Archery, Croquet and Lawn Tennis club. However, this club closed in 1927. In 1909 the family of Sir John Phear, who owned Marpool Hall and Marpool Park, gifted the lower part of the park to the people of Exmouth for recreational purposes. The local council (Exmouth UDC) decided to lay a bowling green in the park, which by now had been renamed Phear Park, in a bid to attract visitors. The green was in the lower end of the park where the skate boarding area now is and within two weeks of the green being opened in 1911, a bowls club – Phear Park Bowling Club had been formed on 3 July. The vast majority of founder members were business or professional men in the town. Phear Park Bowling Club was one of the first 20 clubs to affiliate to Devon County Bowling Association. The driving force behind the club was the Council Surveyor – Samuel Hutton. Mr Hutton was club captain for 20 years and his other claim to fame was that he was the uncle of Len Hutton the Yorkshire and England cricketer. In the first season (1911) the new club played five games and won the last one – against Heavitree. However, 10 years Phear Park Bowling Club had won the County Trophy and a member, Harry Taylor, became county singles champion. 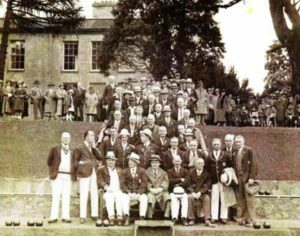 The club also won the county rinks title in 1921, and had another member in the final of the singles on two occasions, but he lost them both. In 1924 an Indian business man Sir Ismael Sait, a friend of Phear Park Bowling Club’s President Col. Richard Hancock, donated a silver cup to the club. This was known as the Calcutta Cup and was offered as a prize in an annual open tournament. During the 1930s some of the finest bowlers in the south west entered the tournament. In 1936 the Council decided to increase the number of tennis courts in the Park and they built three courts on the bowling green. A new green was laid on the present site in front of Marpool Hall which had been bought by the Council in 1935. During the war Marpool Hall was used to house evacuees and then American servicemen prior to D-Day. After the war the club won the county rinks championship. In 1950 the Council demolished the Hall and built a pavilion on the site and we are still using this today. Club membership fell after the war but grew during the 60s and 70s to such an extent that the management committee put a ceiling on membership. During the 1960s and 70s the green was considered one of the best in the south west and was one of the two fastest greens in the county. A number of county matches were played here as well as the finals of county competitions. Plans were made to lay another green but this was abandoned when a local government reorganisation shifted responsibility for it from Exmouth to the East Devon Council. In 1969 and 1970 Phear Park bowler Beatrice Harvey won the county two wood finals. The first time a lady bowler had won this title in successive years. 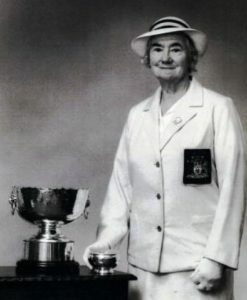 In 1971 Mrs Christine Frost (above) became county singles champion and went on to win the national title. This was a remarkable feat as she had only been bowling for six years. Next season, Mrs Frost represented England in the inaugural UK championship but lost to the Welsh champion 21 – 20. Phear Park Chairman Harold Davis was elected County President in 1979. Park has a long tradition of nurturing young bowlers and a number of the founder members were in their twenties. Before the last war a young bowler named Bev Walker was brought here by his father and played at Phear Park for 8 years before joining the Devon Constabulary. Bev Walker had an illustrious bowling career, as an international, county champion and President of the County Association in 1974. Other young bowlers who set off on the road to bowls stardom at Phear Park included Bill Davis, now at Madeira and more recently Craig Ralph and Chris Cleaver. Craig has been a Middleton Cup player for several years and Chris was a Middleton Cup squad member in 2007. Chris was county under 25 champion in 2006 and Middlesex under 25 champion. However, both bowlers have now moved on to other clubs. Phear Park was also proud to have one of the oldest players in the county. Harry Wilkes was playing regularly up until he was 93 years old. (Sadly Harry Wilkes age 100 Passed away in 2016). One of the beauties of bowls was seen when his opposing leads in two matches were a 10 year old and a 14 year old! In the past 100 years Phear Park Bowling Club has had it’s highs and lows, but we have always tried to play the game in the right spirit and enjoy it – win or lose. But, of course, we enjoy it more when we do win.